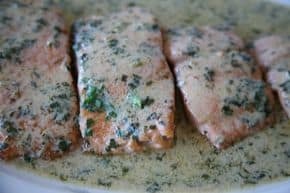 Mustard is such a great companion to cooked salmon; it adds a lot of flavor and cuts the -fish–oil taste, especially with a little lemon juice and some good dry white wine added to it. Season the salmon with ¼ teaspoon of the salt. Heat a large nonstick skillet over -medium–high heat. Add the olive oil. When the oil is hot, add the salmon, and sear on both sides, about 2 minutes per side, but don’t worry about cooking the fish all the way through at this point. Remove the salmon to a plate, pour out the oil, and wipe the skillet clean. Return the skillet to -medium–high heat, and add the butter. When the butter is melted, add the lemon juice and white wine. Bring to a boil, and whisk in the mustard. Lower the flame and let the sauce reduce by a quarter, about 3 minutes; then add the heavy cream and the remaining ½ teaspoon of salt. Slide the salmon back into the sauce. Simmer until the salmon is cooked through, about 3 minutes. Whisk the parsley into the sauce and serve. Asparagus- Melt butter in a skillet over medium-high heat. Stir in the olive oil, salt, and pepper. Cook garlic in butter for a minute, but do not brown. Add asparagus, and cook for 10 minutes, turning asparagus to ensure even cooking. Copyright © 2019 Holliston Superette. All rights reserved.